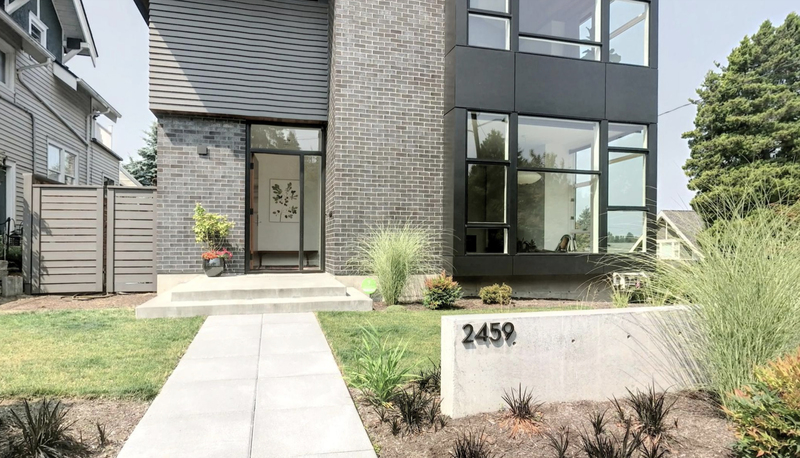 This house for sale in the quiet neighborhood of Madison Park, Seattle, is a gem waiting to be discovered, but hurry! It will not stay on the market for long! Behind the front yard (a golden opportunity to plant flower beds and trees! ), this contemporary house stands proudly, stunning with her clean lines and large windows. Walk into this house for sale and hang your jacket in the entry’s closet before making your way into the sun-splashed living room. Wow! The corner bench by the windows is perfect for a cozy reading nook; You can count on the two-face fireplace to keep you warm and comfortable all year round. And what can we say about this oh-so-perfect wood room divider? Fire up your inner chef with this restaurant-worthy kitchen that maximizes storage space with up-to-the-ceiling cabinets, countless drawers and even a wooden shelf that splits the window in half—what a smart idea! Facing the vintage-looking mint-green backsplash, a huge two-tone kitchen island doubles as a breakfast bar. Invite your guests to dine in this incredible dining room where space is not an issue! If it’s warm outside, sit on the patio to enjoy a glass of wine. Lovely and private, the backyard is entirely fenced to allow pets and children to play in full safety. Time to move upstairs, where you will find, at one end of the bright hallway, the large master bedroom—a clean, simple and refined room with a splendid wood ceiling and its own private bathroom. Let the sunshine in and energize you in the morning! This minimalist and modern spa-like bathroom invites you to take your time and relax in the sumptuous freestanding tub or walk-in shower. What’s better than a spa escape in the comfort of your own house? The clean and simple guest room is a place of beauty and relaxation that friends will never want to leave! A colorful wallpaper celebrates fun and happiness in this extremely well-designed nursery. Large windows allow ample natural light during the day, and a big closet keeps the room tidy by storing toys and clothing. This playful bedroom will definitely make a little boy or girl very happy! And now, down to the basement, which is anything but dark and dusty: You will find that it is the perfect space for movie nights, band rehearsals and board game afternoons. This bright and spacious floor holds a cozy den and a lobby with the potential for a mudroom hallway. A third bedroom lies here too, right in front of the bathroom. What will you do with that extra room? A home office, perhaps? The whole family will find no problem calling Madison Park home. A quiet neighborhood in the heart of the buzzing city of Seattle, it is perfect for food and nature lovers: After a scrumptious brunch at Bing’s, take a dip in Lake Washington at the Madison Park Beach, where children can swim safely in the shallow area under the careful watch of a lifeguard. Finish the day with a delicious platter of sushi and sashimi at Nishino before heading back to your beautiful house, where you will sleep soundly without a doubt. Spa-like bathroom? Check. Restaurant-worthy kitchen? Check. This light-filled Madison Park house has literally everything to please!